Greetings friends and fellow crafters. LeeAnn here again with a card I made for the KatScrappiness November Challenge. Since I had my Neat & Tangled "My Favorite Nut" stamp set still out and had already cut the little items, I figured why not put them to use. I grabbed my Distress Oxides in Broken China, Vintage Photo and Fossilized Amber and went to work. On a 4" x 5.25" piece of watercolor cardstock I inked up the front using the Broken China. I then spritzed it with my distress sprayer and let it sit. I then inked up the area of the card base which is made of 110 lb Recollections cardstock where the hexagon would show from after using the die. At this point I took the Broken China panel and used my big shot to cut the hexagon Pop Out Die from Kat Scrappiness. 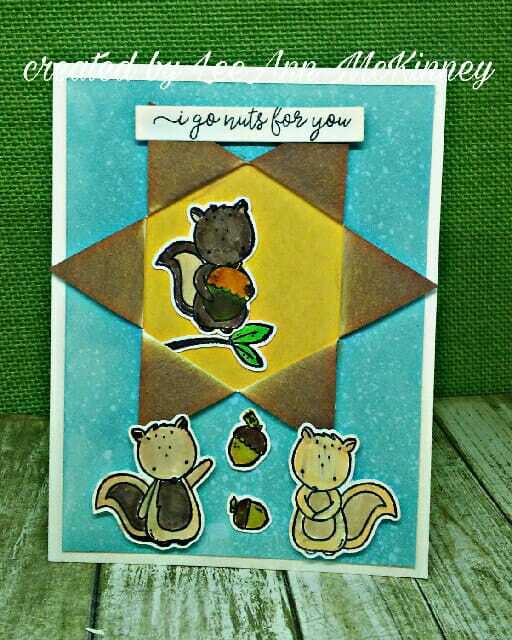 I stamped the sentiment "I Go Nuts for You" and used one of the sign bars from the Sign Post Set from Kat Scrappiness and my Big Shot to cut that out. after having the hexagon cut, I masked off the area and added the Vintage Photo to the inside of the cutout. I colored all my images using a combination of Spectrum Noir and Memento markers. All images are stamped using Memento Tuxedo Black ink.